Take a two-minute trip through the Universe, and back again. Find out about the Milky Way, the galaxy where we live. Watch a video clip about how the Universe is expanding. Watch a video clip about the Hubble Space Telescope. Watch a clip about how to spot the constellation Orion. An animated movie about the Large Hadron Collider (LHC) and how it works. Can you sort out objects in the Universe? Create your own Universe timeline, test your knowledge of the Universe or find other activities and games about space. What’s the universe made of? Where did everything come from? Lift the flaps in this fascinating book to reveal some of the amazing discoveries that astronomers and physicists have made in their quest to unlock the mysteries of the Universe. Curious young minds will be fascinated to discover planets, stars and galaxies and explore intergalactic space, with over 70 flaps to lift. Includes explanations of some of the biggest questions in the universe, including ‘What happened during the Big Bang?’ and ‘What lies out in the far reaches of space?’. 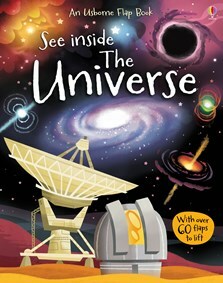 A mind-expanding book sure to fascinate young space enthusiasts. “See inside the Universe” takes us on a whistle-stop tour of the universe, from stars and galaxies to the Big Bang and the Big Crunch, via astronomy and particle physics. It’s so dense – there are flaps hidden within flaps – that it’s one of those books kids and parents can dip into time and again. Good introduction to the solar system, offering information in bite-sized chunks. The ‘science’ of gravity, the Big Bang, atoms – all presented with over 70 flaps to lift, this will be a great recommendation for the boffins of the future. It’s an interesting book for my little one this book is full of wonderful info about the universe. My five year old is very interested in facts and loves this book. Since having it we have gone on to buy several more of the series, all of which he finds really interesting and asks for over and over again. His other particular favourite is 'See under the Sea'.